"The best version on any platform"
Picomy has announced that its 2015 adventure platformer Heroki will arrive on Nintendo Switch next month. 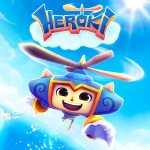 Originally published on iOS, Heroki sees players flying headfirst into an award-winning action adventure, tasked with saving a whimsical world full of flight and fantasy. Players must master the wind to fly, freefall, dash, and bash their way across the game's sky-islands, jungles, seas, and deserts. The developers have stated that this is "the best version of Heroki on any platform", perhaps thanks in part to some of the Switch's unique features like HD Rumble. You can check out a full feature list below. The game is scheduled to launch on 20th July, but a pre-purchase option will be available from 30th June. This pre-purchase will have a limited-time 30% discount, hacking down the game's usual $9.99 price point. Do you like what you see from the trailer above? Are you tempted by the pre-purchase discount? Let us know your initial impressions with a comment down below. This is giving me a bit of a Lost Winds Vibe for some reason. Really love the look of the artstyle. So colourful! Seems like a fun game to clear within a day, and for only 10 bucks. Sold! Really digging the visuals and art style by the way. I love how colorful this looks! Ten bucks for that? I can't imagine how this could be a disappointment. It looks colorful and whimsical to me. Love the character design too. And a 30 percent off pre purchase option? Excellent! Saw thumbnail and thought this was finally Katamari on Switch for a second. Bummer. Heroki-dookey, I'm in with that pre-order offer. Looks lovely. That game looks charming as hell, consider me insterested. Gives me hope to see Billy Hatcher come back eventually. SEGA just merge with Nintendo already, work the arcades while Nintendo makes Sonic amazing again. I have this on my iPhone. I got it because it was a SEGA release - and wanted to support them. A bit short but was only $4 on Mobile. Loved this on iOS (played it with a controller) shame there are no additional levels etc but with the discount may bite. Highly recommended! This is one of the few iOS games I've actually enjoyed and finished. Hope it does well on the Switch. I hope this game finally sells as well as it should. It's such a gorgeous game, but the touch screen controls on mobile didn't do it justice. I’m in. Platform, nice looking graphics, discount at pre purchase!!! All the right condiments. The art style is wonderful, sadly everything else screams mediocre mobile game to me. Personally, I’ll pass on this, but I hope it does well and people enjoy it. This looks great and seems like it will be a fun game. The main thing that irritates me is when you pick up the coins (or whatever they are), you see them go from one end of the screen to the top left corner and it's a bit distracting. Have this on my iPad. It's a nice game that will benefit from physical controls. Looks pretty good, with lovely graphics! @mist The article says 60. Can't believe I haven't heard about this game before at all. Immediately on my watch list.